Signature Kajal has been formulated using natural herbal and plant extracts. This signature Kajal will relax and soothes your eyes, it will encourage growth of eyelashes, it shall help to maintain and improve vision. 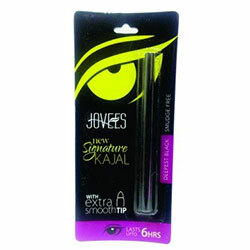 This signature Kajal is water/smudge proof under normal conditions. Apply on the outer side of your upper and/or lower eye lids and on the inner side of your lower lid. Natural carbon, Amla oil ext, Bahera Oil ext, Harar oil ext. Almond oil, Castor oil, Sesame oil, Vitamin C, Vitamin A and Carrot oil.